“Break the Banks Up!” is an all too familiar political outcry coming from Vermont Senator Bernie Sanders, presidential hopeful. But need that be an anchor on which much of Sander’s campaign rests? There are cheaper ways of doing things than to pass an action off to taxpayers in a financial way. Yes, it’s true. 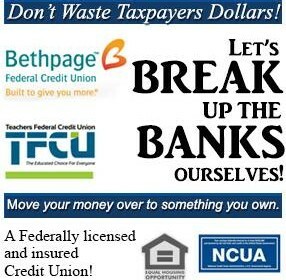 A taxpayer can take charge and beat big bank corruption by easily, safely and securely transferring their money out of banks and into a federally licensed and insured credit union of which they are an owner. Yes, it works. Since the first “Bank Transfer Day” in 2011, millions of account holders have moved billions of dollars to credit unions.